Living in Columbia County, New York, we are surrounded by many wonderful farms. We have picked apples and cherries at the Love Apple Farm. We have picked strawberries at the amazing Thompson Finch farm. For a year or two the girls, in high school, earned a few dollars waking before dawn to pick strawberries there. We have picked blueberries at a hidden farm in the mountains by Sheffield, Massachusetts. Upon being told what we were doing while driving to the blueberry farm, Levin exclaimed: The devil has fallen upon me! Is is possible our children didn't appreciate the fruits of their labor?!? Here are Jirina picking blueberries and Amaran picking cherries. The cherries and blueberries are sewn-on beads, in the tree and bush and in the baskets. The girls stand in a field of white flowers and marigolds blooming in a line behind them. The trim pattern at the hem is green swirls on a changing orange background. There is also a leafy lace trim at the hem. The neck and armhole openings are periwinkle picot trim. One year in school Jirina memorized quite a bit of the poem Hiawatha. 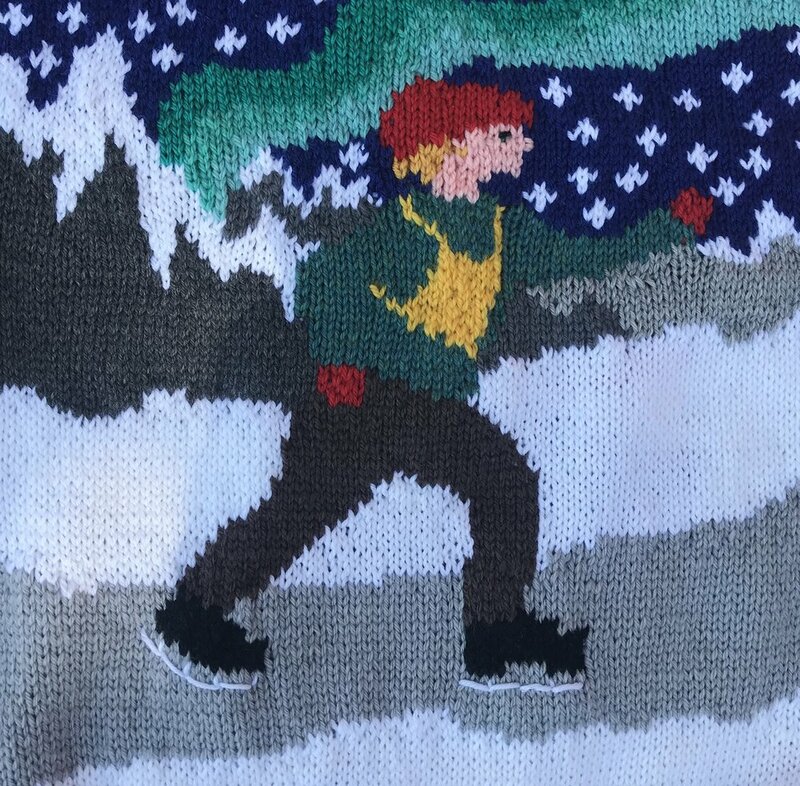 That and the wonderful book Hiawatha illustrated by Susan Jeffers inspired this sweater. The top pictures show the sweater I made for Jirina, and the bottom pictures show an adaptation of that sweater. On the front Hiawatha stands with rainbow colored birds around him as he holds a blackbird in his hands. The brightest, largest sun is rising behind the hills. On the back he stands with various animals beside him. On the second sweater the same tree wraps around from the back to the front. One sleeve shows a dome-shaped house with a fire in front. The other sleeve shows a rainbow stretching across the sky, with flowery fields below. The trim patterns changed from one sweater to the next, but the color scheme of green, red, and yellow and the triangles/diamonds remain. 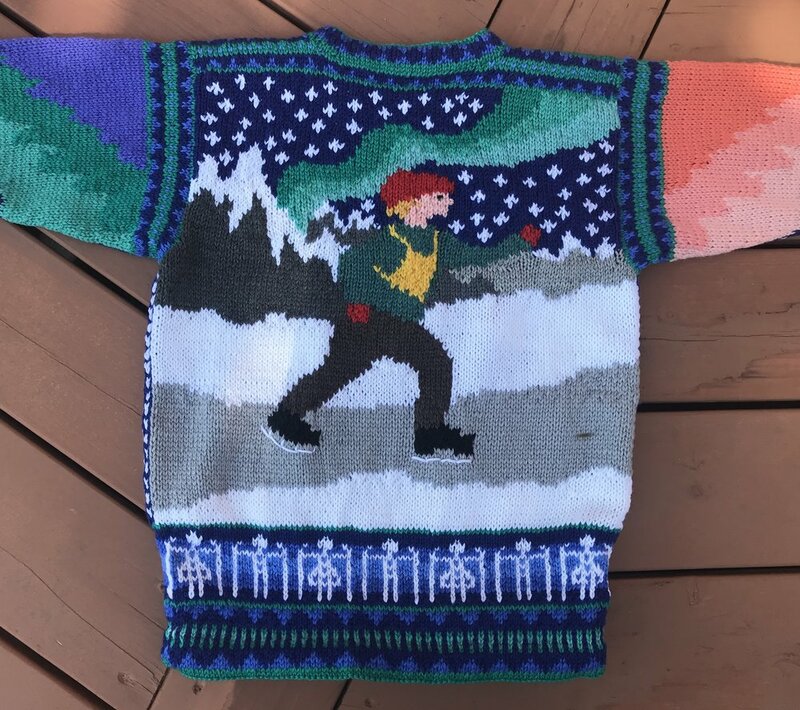 This sweater was suggested by someone on Etsy. 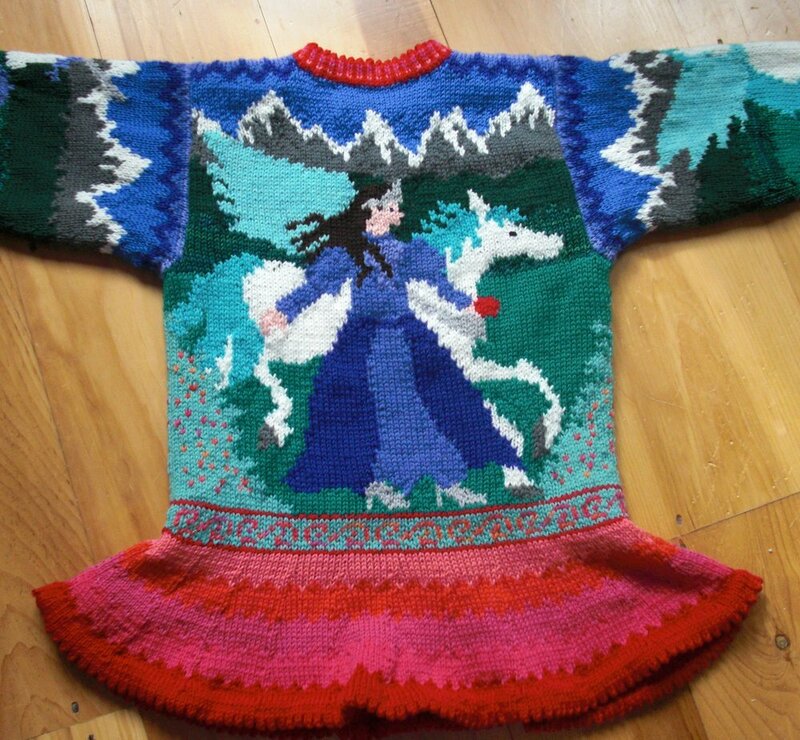 The picture is an adaptation of Amaran's Alanna sweater. 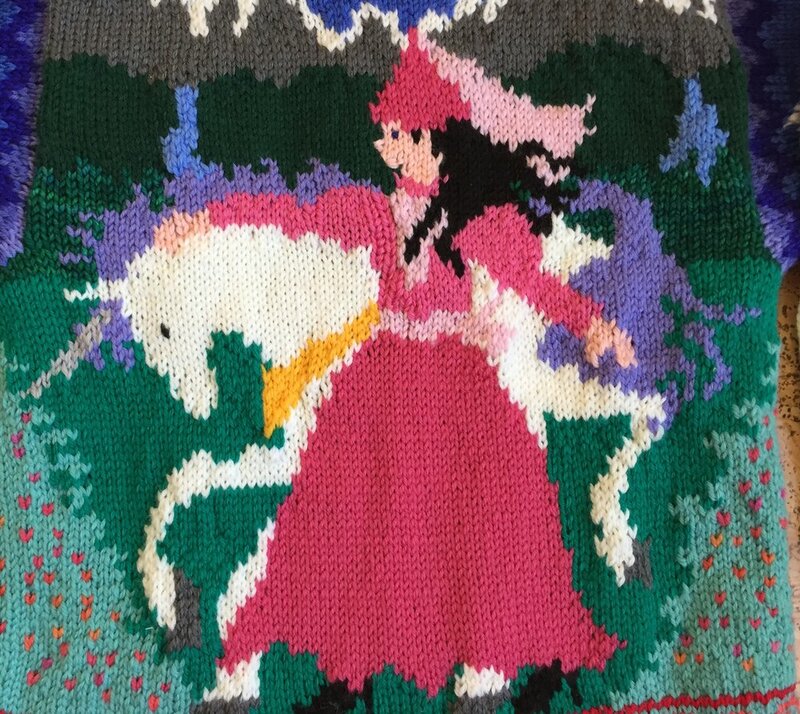 On the front Alanna has been replaced by a pink princess and the horse has become a unicorn with purple mane. 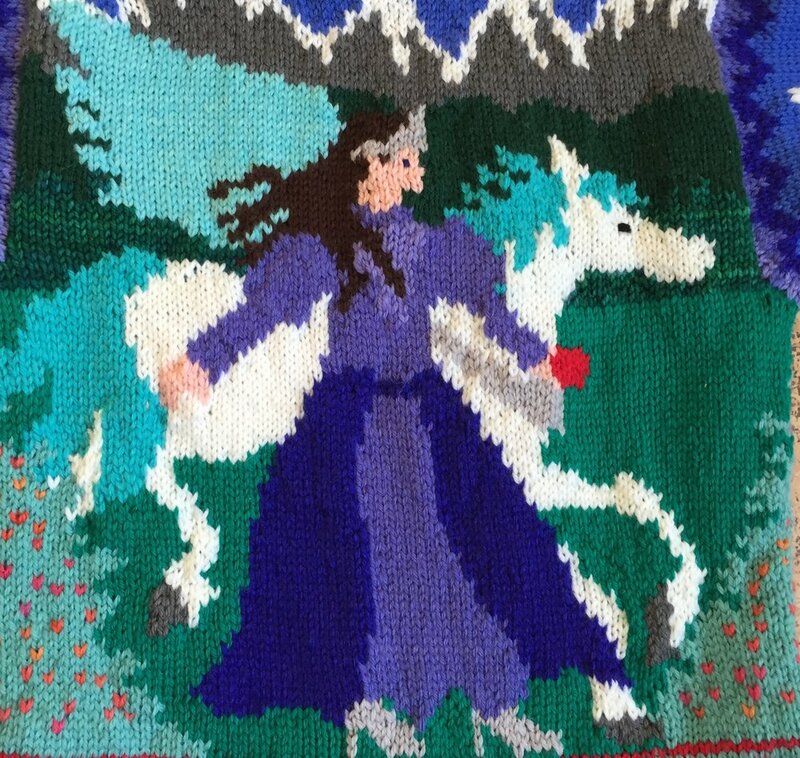 On the back the princess wears purple and she accompanies a turquoise-maned and -winged Pegasus. The sleeves show the unicorn and Pegasus alone. The princesses stand in a clearing, surrounded by flowering light green plants and mountains and rivers behind. 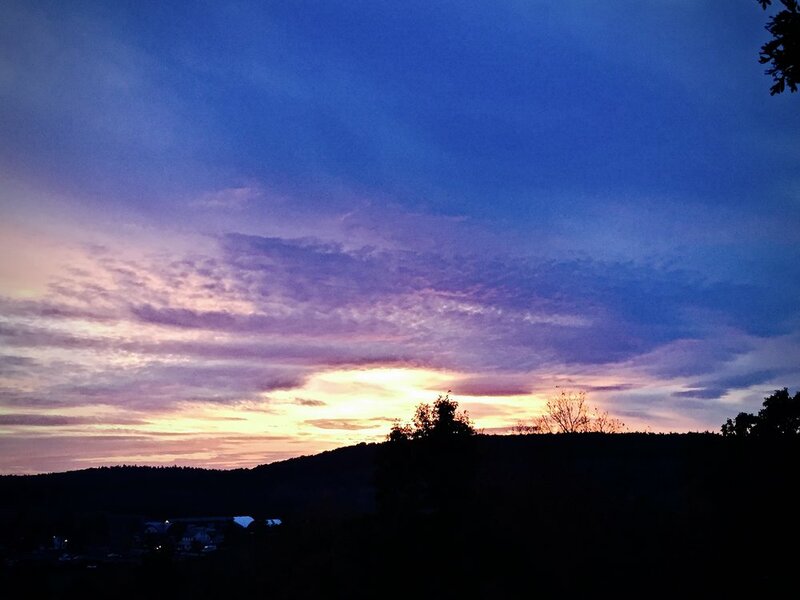 The blue of the sky turns into jagged patterns in dark blue and purple. The wrists and hem trim is variegated red swirls on light green. The neck and wrists trim have alternating variegated red and dark pink striped with a picot edge. The peplum has the jagged pattern in stripes of pink and red, ending in a picot trim. This is my nod to the wonderful Lillehammer Olympics. 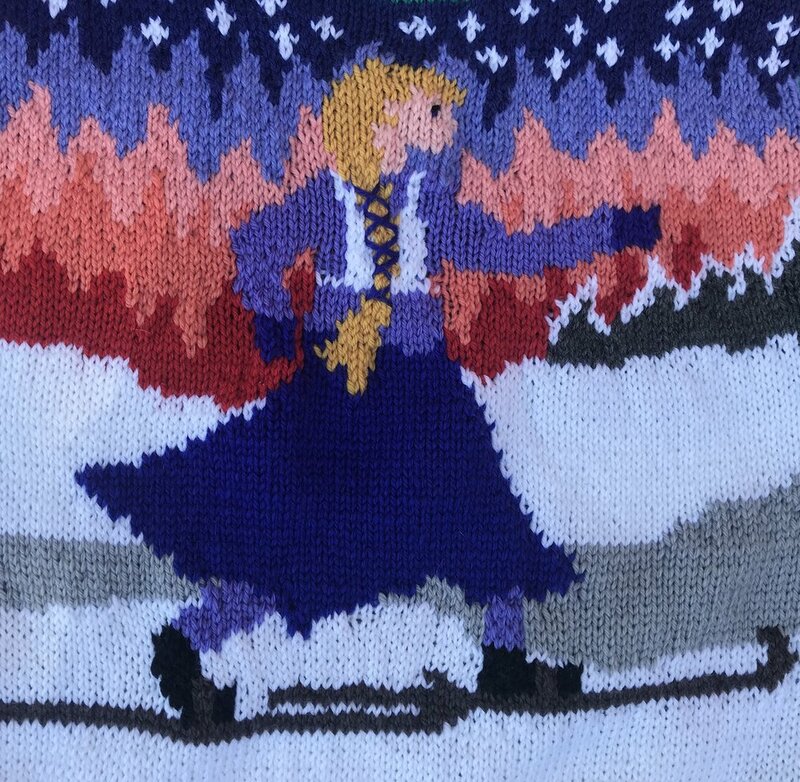 On the front a girl is cross country skiing (with no poles?) as the red Northern Lights fill the sky behind her. Mountains and stars fill the scene. On the back a boy is speed skating as, again, the green Northern Lights stream behind him. Same mountains, same stars. (This is obviously a very old Olympics! I'm pretty sure nobody participates in the Olympics in these clothes anymore. Did they ever?) 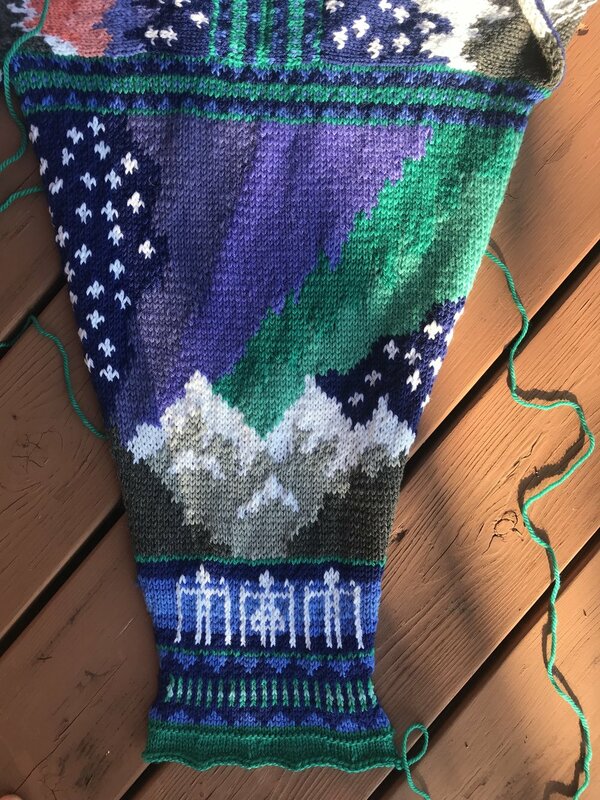 On the sleeves are mountains, stars, and aurorae in reds and greens and purple. The wrists and hem trim shows traditional Scandinavian people with skis in white on a changing blue background. There is also a trim pattern of blue triangles and green circles. The neck trim is white triangles on blue and white dots on green. 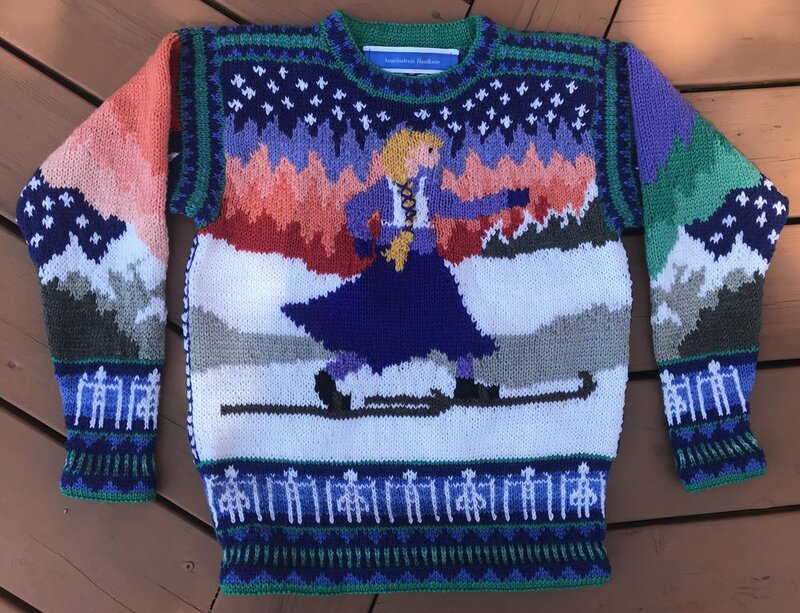 The first two pictures are the original sweater. The following pictures are of a more recent version. My children's school is lucky enough to have a dedicated Puppet troupe, called the Magical Puppetree. One year, one of the productions was Saint George and the Dragon. We also had the book by Margaret Hodges and Trina Schart Hyman, so those inspirations became the four year sweater for Levin. Here the design is reworked for size nine. On the front St George wields a sword toward a flying, fire-breathing green dragon with turquoise wings. On the back is a castle in the sky with angels flying around it. The sleeves echo these two patterns, with the dragon on the ground and the castle against a moon-lit sky. There are several trims: of white, red-cross shields against a blue background, of white dots on red, and of white diamonds on red. The neck, wrists, and hem trim is dark blue with variegated blue stripes.